The Friends of the Library is a group of volunteers who support the library. Anyone can be an FOL member with a small donation of $10 a year. If you are interested in becoming a member of the FOL, you can stop by the library and pick up an FOL brochure which has the membership application inside. The Friends of the Library are always accepting donations. You can donate money or you can donate your gently used books, magazines or audio visual materials. Some of these materials may be added to the library collection, but most of them are sold in the FOL Bookshop. If you would like to make a donation of materials, please bring them to the Circulation Desk during the library's operating hours. You can also receive a receipt for your donation for your tax records. 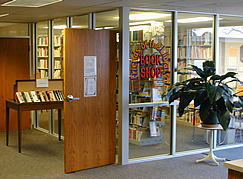 The FOL Bookshop has been part of the library since 1998 and over the past two decades has raised more than $200,000 and averages nearly $1,000 in sales each month. All of these proceeds come back to help support library programs and services. The bookshop is typically open whenever the library is open. If you are interested in working in the Book Shop on a regular or substitute basis, please contact Jessica Foster or call 870-935-5133 extension 9981. You can also submit a volunteer application. Volunteers typically work two hour shifts.